BookBuyBack is the perfect way to save money when it comes to selling your books. As the semester ends you rush to the bookstore and sell back your books for a lot less than you bought them for just to get a few dollars fast, and you end up blowing most of the money partying anyways. Wouldn’t you like to get more money for your textbooks? 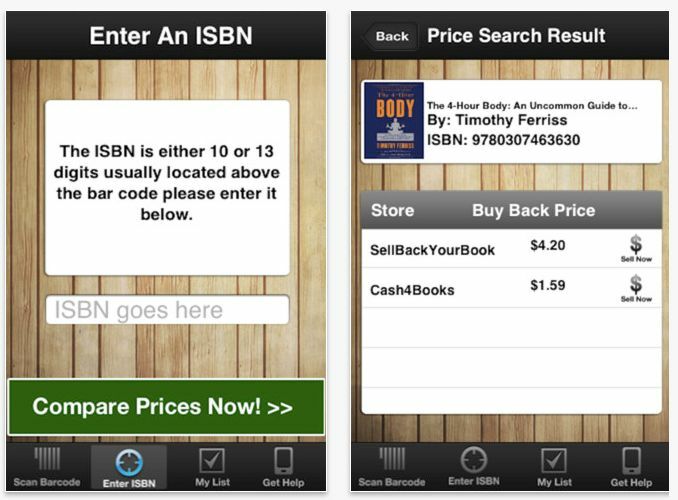 BookBuyBack is a simple and handy iPhone/iPod Touch application that can quickly get you the best price for your book(s). All you have to do is scan the barcode on the book and it will instantly give you prices of companies that will buy the book from you. If for some reason you can’t scan the barcode with your camera, you can enter in the ISBN and quickly get a handful of prices from different stores. I entered in an Earth Science book and got back 4 different prices. BookByte gave $1.25 more than Amazon did on a $5 book. This tool is very handy if you want to get the most money back for your books. These stores will even send you a prepaid envelope to ship. The only downfall is that it could take up to a week or so before you get paid. Some of the sites will pay you very quick and even use Paypal. Before you sell your next book or if you have a lot of old novels laying around, check out BookBuyBack and see how much they are worth. It is fast, easy, will save you money, and best of all it is FREE on the App Store. Go check it out! Also be sure to check out the BookBuyBack website: BuyBackTextbooks.com.